During the early 1980s, the United States witnessed a new environmental campaign taking shape—one rooted in the civil rights and anti-toxics movements of previous decades. 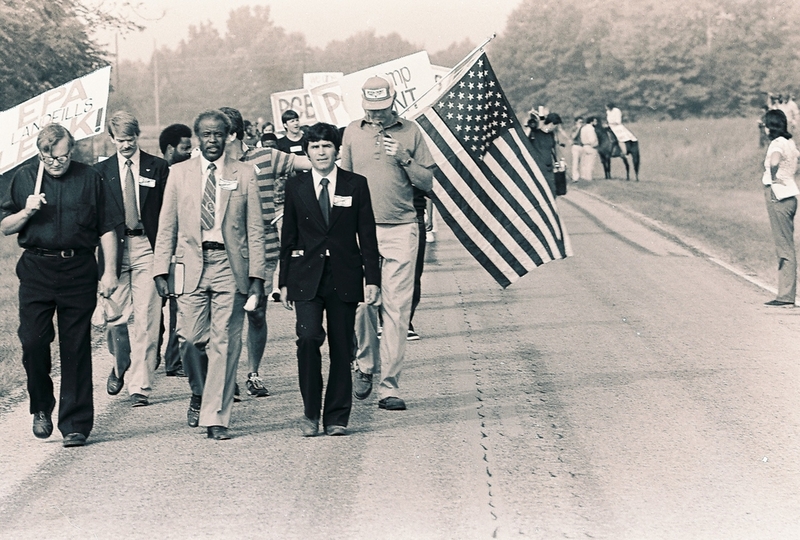 In September of 1982, the residents of Warren County, North Carolina marched in protest against the siting of a local polychlorinated biphenyl (PCB) landfill. Four years prior, over 30,000 gallons of waste oil contaminated with PCBs were illegally discharged onto roadsides across the state. After the Environmental Protection Agency (EPA) designated these sites for remedial cleanup, the state needed a place to dispose of the contaminated soil. In 1979, the North Carolina Department of Environmental and Natural Resources chose the rural, poor, and predominantly black Warren County for the landfill. The local NAACP filed suit in an attempt to block the landfill, but ultimately failed. The first trucks to arrive at the site met with sharp protest, resulting in hundreds of arrests. Soon, communities across the United States followed suit. Residents from predominantly low-income, minority communities—from Chester, Pennsylvania and Camden, New Jersey, to Los Angeles, California and the small parishes along the Mississippi River between Baton Rouge and New Orleans—protested local government decisions to license the siting or expansion of landfills, hazardous waste facilities, and other environmentally-unfriendly land uses near their homes. Through grassroots organizing and civil rights activism, the quest for environmental justice had begun. 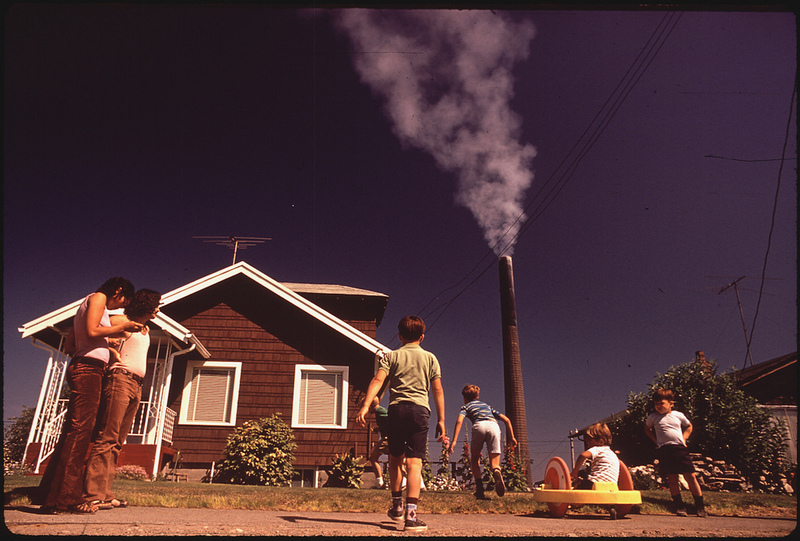 The environmental justice movement emerged in response to an alarming amount of evidence that low-income communities of color are not only burdened with a disproportionate share of environmental hazards, but also less likely to enjoy the environmental and human health benefits of parks, recreation, public sanitation, and other quality-of-life factors because of expense or disproportionate allocation of public resources. So the question arises: is the environmental justice movement concerned with ecological preservation (i.e., going "green") or the promotion of public health? As the conservation movement gained force, urban living conditions during the late-19th century, which deteriorated rapidly from industrial pollution and the failure of public sanitary systems to accommodate an increasingly dense urban society, stimulated a growing public health movement in the United States. 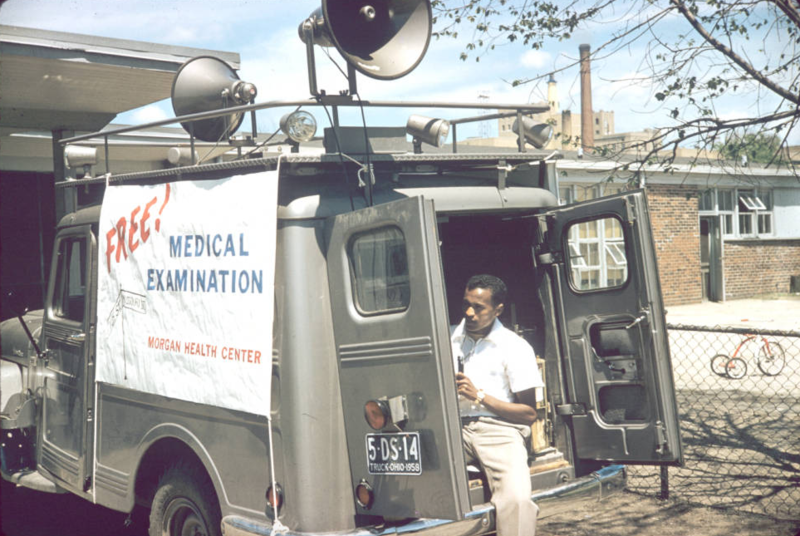 Unlike the conservation movement, the campaign for public health made a distinct connection between the environment (both natural and built) and the physical well being of humans. While distinctions between the two movements have, in recent decades, become blurred—especially in areas related to lead poisoning, municipal water treatment, and air quality—an anti-urban bias continues to pervade the underlying philosophy of the major environmental organizations today. With its health and human-oriented approach, environmental justice emphasizes the interaction between the physical and natural world. In this sense, “environment” concerns not only the ecological preservation of natural resources, but also the protection of healthy living spaces—the daily settings where people live, work, play, worship, and go to school. Accordingly, EJ advocates seek to prevent environmental threats in housing, land use, industrial sitings, health care, and public sanitation services. In response to the events of Warren County and mounting concerns over environmental inequity, several studies were conducted to examine the siting of environmentally hazardous landfills and the demographics of the host communities. In 1983, following congressional approval, the U.S. Government Accountability Office (U.S. GAO) released Siting of Hazardous Waste Landfills and Their Correlation with Racial and Economic Status of Surrounding Communities. The study revealed that 3 of 4 off-site commercial hazardous waste landfills in the EPA’s Region 4 (composed of 8 southern states) were located in predominantly African-American communities, although African-Americans made up only 20% of the region’s population. Four years later, the United Church of Christ Commission for Racial Justice (CCCRJ) published Toxic Waste and Race in the United States. The investigation found that race was the most potent variable in predicting where waste facilities would be located—more powerful than poverty, land values, and home ownership. In 1994, President Bill Clinton issued Executive Order 12898, Federal Actions to Address Environmental Justice in Minority Populations and Low-Income Populations. With a goal of achieving environmental protection for all communities, the Executive Order places special emphasis on the environmental and human health effects of federal action on of minority and low-income populations. In meeting these ends, the Order specified the creation of an Interagency Working Group on Environmental Justice, directed research and analysis of human health and environmental hazards, and underscored public participation and access to information in the environmental decision-making process. The Presidential Memorandum accompanying the Order highlights existing laws to “ensure that all communities and persons across th[e] Nation live in a safe and healthful environment.” Specifically, the memo focused on Title VI of the Civil Rights Act of 1964 and the National Environmental Policy Act (NEPA). Title VI prohibits discrimination on the basis of race, color, and national origin in programs and activities receiving federal financial assistance. NEPA requires federal agencies to consider the environmental impacts of their proposed actions and reasonable alternatives to those actions. Procedural provisions under NEPA further require periods for public commenting, which the lead federal agency proposing the action must consider in the planning process. The explicit recognition of environmental inequities by the federal executive provided the EJ movement with a strong sense of accomplishment. Yet despite these promising measures, other developments severely limited genuine environmental equality as a matter of law and policy. In 1992, Representative John Lewis and Senator Al Gore proposed the Environmental Justice Act. The bill (H.R. 2105, 103rd Cong.) was intended to “establish a program to assure nondiscriminatory compliance with all environmental, health and safety laws and to assure equal protection of the public health.” Despite the support of 44 co-sponsors, the bill died following a series of subcommittee hearings. The following year, the Act was redrafted and reintroduced (S. 1161, 103rd Cong.) by Representative Lewis and Senator Max Baucus. Again, the bill died after committee referral. Beyond the federal legislative arena, environmental justice claimants have encountered mixed results in the courts. The majority of successful claims originate in traditional common law nuisance theories or under environmental laws such as the National Environmental Protection Act. On the other hand, claims alleging equal protection violations under the Fourteenth Amendment have largely failed because of the high evidentiary burden of proving racial motivation or discriminatory intent. Despite recommendations set forth in the Clinton Memorandum, complaints alleging disparate impact discrimination on the basis of race in violation of Title VI of the Civil Rights Act of 1964 have likewise proven futile. In 2001, the U.S. Supreme Court held in Alexander v. Sandoval, 525 U.S. 275, that no private right of action existed to enforce disparate-impact regulations promulgated under Title VI. At the federal administrative level, the EPA has been particularly slow in developing a framework for investigating and acting upon claims of discrimination. In addition, a 1992 investigation by the National Law Journal revealed compelling evidence of racially inequitable enforcement of federal laws and cleanup efforts by the EPA. In response to governmental efforts at the federal level, and expanded grassroots organizing at the local level, many states have developed programs to address environmental justice concerns. The states have proven especially innovative in confronting EJ issues—undertaking a variety of collaborative, problem-solving approaches; encouraging community participation and education initiatives; and implementing creative land-use techniques to reduce health risks and prevent environmental degradation. While progress varies widely, the states provide a potential alternative forum for redressing inequitable environmental burdens. The Public Law Research Institute at the University of California, Hastings College of Law publishes Environmental Justice For All: A Fifty-State Survey of Legislation, Policies and Cases, currently in its 4th edition (2010), a resourceful tool in monitoring EJ developments across the United States. Northwest Indiana, spanning the southern shore of Lake Michigan, has experienced a century of severe environmental degradation. This is largely because of the steel and petroleum refining industries, because of alteration of the natural ecosystem by filling of dunes and wetlands, and because of overall development. Ozone and particulate nonattainment, 10 million cubic yards of contaminated sediments in the Indiana Harbor Ship Canal and the Grand Calumet River, millions of gallons of free-floating petroleum products in the ground-water, and numerous sites contaminated with hazardous waste—including 15 Superfund sites—are some of the many environmental challenges facing the area. The program was established to help minorities and low-income communities address local environmental justice issues through formal partnership agreements with colleges or universities. The winners have created projects that will increase environmental awareness, expand community outreach and provide training and education to socio-economically disadvantaged communities impacted by environmental hazards. Among the grant recipients was Indiana University Northwest, which used the funds to establish the Northwest Indiana Environmental Justice partnership and Resource Center (EJRC). The mission of the EJRC was to (1) research evidence of an environmental “disproportionate impact” on core urban communities in Northwest Indiana; (2) create a partnership between IU Northwest and community organizations concerned with environmental issues in the urban core of northwestern Indiana; and (3) provide residents with information and data relating to environmental issues in urban areas of the region. Although the EPA grant ended in 2003, the Center continued for several years to facilitate EJ activities in the region through funding from the IU Northwest Library Data Center. [b]oth low-income residents and black residents (who make up 90 percent of the minority population) are disproportionately located near TRI (toxic release inventory) facilities in Indianapolis, Indiana. As a result, these populations may face greater health risks from hazardous air emissions. In 2000, IDEM convened the Interim Environmental Justice Advisory Council—a stakeholder-based group comprised of citizens, environmentalists, academics, and industry representatives from across the state—to assist in developing an EJ Strategic Plan. The Plan, adopted in August 2001, offered a vision statement: "No citizens or communities of the state of Indiana, regardless of race, color, national origin, income or geographic location, will bear a disproportionate share of the risk and consequences of environmental pollution or will be denied equal access to environmental benefits." Address IDEM’s obligations under Title VI of the Civil Rights Act of 1964. The Plan also contained several goals, including: (1) identification of geographic areas of EJ concern; (2) community education on EJ issues, public participation in environmental decision-making, and the agency’s statutory responsibilities; (3) ensuring opportunities for affected parties to communicate their concerns to IDEM on facility permitting and other decisions involving EJ issues; (4) IDEM staff education; (5) evaluation, with community input, of the effectiveness and appropriateness of existing public processes for environmental decision-making; and (6) involvement of other state agencies (e.g., Indiana Department of Transportation) in EJ discussions to assist in developing their own programs. Other IDEM initiatives utilizing the EPA EJ grant included GIS mapping, a Guide to Citizen Participation (originally published in English and Spanish), and a brochure on How to Participate in Environmental Decision-Making. The agency's EJ mapping project—which used census data on the state’s demographics and GIS software to collect information on Superfund sites and hazardous waste facilities—helped identify the proximity of low-income and minority residents to environmental hazards. In 2006, IDEM adopted its first environmental justice policy. The policy, amended in 2008, identifies EJ as including the "fair treatment and meaningful involvement of all people in the implementation of environmental decision-making pursuant to all Federal and State environmental statutes, regulations and rules." Accordingly, IDEM endeavors to ensure that all members of the public have (1) equal access to pertinent agency policies and procedures; (2) adequate notice of agency program information and decision-making processes; and (3) opportunities for commenting and providing information to agency staff. For nearly 20 years, the State of Indiana has made great strides in promoting environmental justice. And the state's contributions to the national EJ movement have not gone unnoticed. In 2002, the National Academy of Public Administration—a congressionally-charted non-partisan organization—published a report on the environmental justice efforts of four states, which identified Indiana as one of four "models for change." While Indiana's early EJ contributions warrant praise, the state's program is not without deficiencies. IDEM's 2006 EJ policy, among other things, affirms the importance of meaningful public participation in the environmental decision-making process, emphasizes adequate public notice of agency activities through communications other than English, and seeks to broaden an "institutional awareness of differences in local conditions and population groups." Overall, however, the policy represents a general departure from the agency's initial focus on low-income, minority populations. Rather, as noted in the PLRI Survey, "it promotes the idea of participatory democracy by all affected populations." Access to information—whether related to the environmental decision-making process, potential environmental hazards to local communities, or other matters—is a core principle of the EJ movement. Many of IDEM's early initiatives, such as the Guide to Citizen Participation, indicated the importance the agency placed on this principle in developing its EJ program. Recently, IDEM seems to have fallen short in prioritizing access to information. In particular, the Guide is currently unavailable. According to its website, "IDEM is presently working on many updates to the document." However, "a timeline for completion of the new Guide for Citizen Participation has not be established." Another issue relates to the structure and organization of IDEM's website. While the site as a whole contains a variety of information on environmental education and how to protect your home and community, the agency's environmental justice webpage is severely limited in its resources, providing links only to IDEM's internal EJ policy and a handful of documents from the EPA and a single NGO. As the environmental justice movement in Indiana matures, the ILA will report back on state and local developments, so check this page frequently for future updates. Bullard, Robert D., ed. The Quest for Environmental Justice: Human Rights and the Politics of Pollution (2005). Rechtschaffen, Clifford, Eileen Gauna & Catherine A. O’Neil, Environmental Justice: Law Policy & Regulation (2d ed. 2009). Rhodes, Edwardo Lao. Environmental Justice in America: A New Paradigm (2003). Environmental inequities result from a number of factors—lack of access to parks and recreation; exclusion from public participation in the environmental decision-making process; or lack of knowledge, resources, or political clout to oppose environmentally-hazardous sitings. Yet many of the underlying causes of environmental injustice extend from the long-term governmental failure to remedy a deeply-entrenched system of racial discrimination. As a result, the environmental benefit/burden disproportionality reflects, in many ways, a de facto form of discrimination rooted in a history of social, political, and economic exploitation—from housing segregation, redlining, school segregation, and limited employment opportunities. Accordingly, the environmental justice movement cannot be understood without this historical frame of reference. The following case study provides a historical overview of housing segregation in Indianapolis and its long-term impact on the environmental quality of the city's neighborhoods and communities. The interactive timeline, located at the bottom of this page, introduces readers to other important historical developments throughout the State of Indiana in the quest for environmental justice. Since the early 1900s, zoning has been the principal method of land-use planning and regulation at the municipal level of government. The city’s ability to zone extends from its “police power,” the authority of states and their political subdivisions to enact measures in preserving the “health, safety, morals, and general welfare” of the people. In 1926, the U.S. Supreme Court sanctioned the municipal exercise of a police power over land use in the definitive case of Village of Euclid v. Amber Realty Co., 272 U.S. 365. The idea that zoning simply relates to local concerns over shaping the built environment ignores the social and economic implications of land-use planning and regulation. Zoning, along with other land use controls, can affect environmental quality, public service provisions, income and wealth distribution, patterns of commuting, natural resource development, and even national economic growth. In 1917, the U.S. Supreme Court declared racial zoning unconstitutional in Buchanan v. Warley, 245 U.S. 60. However, for several years following this decision, a number of cities either revised their racial zoning ordinances or enacted new legislation in an attempt to distinguish their laws from the ordinance declared void in Buchanan and thus circumvent the Court's holding. Litigation ensued when Dr. Guy Grant, an African-American physician, breached a contract with Edward Gaillard for the purchase of a home in a predominantly white Indianapolis neighborhood. Grant based his refusal on the grounds that the ordinance would have prevented him from occupying the property. Attorneys from the local chapter of the NAACP joined the suit and filed a petition seeking to overturn the ordinance on constitutional grounds. The trial court agreed and, relying on Buchanan, declared the zoning ordinance void. Attempts to appeal the case dissolved when the U.S. Supreme Court held the New Orleans’ ordinance unconstitutional in Harmon v. Tyler, 273 U.S. 668 (1927). Absent the municipal authority to enact racial zoning ordinances, advocates of segregated housing relied principally on two alternatives: (1) racially-restrictive covenants; and (2) “redlining,” the government-sanctioned practice of denying mortgage loans based on race and ethnicity. On June 13, 1933, President Franklin Roosevelt signed into law one of the most economically-significant pieces of federal legislation in U.S. history. The Home Owners Loan Act of 1933 introduced Americans to the long-term, low-interest, self-amortizing mortgage. To help stabilize the ailing real estate market, the Act created the Home Owners Loan Corporation (HOLC), the federal agency responsible for refinancing home mortgages at risk of default or foreclosure. Approximately 40% of eligible persons in the U.S. sought assistance under the program. Yet despite its success, the national policy of homeownership and foreclosure prevention failed to apply equally, closing the door on the American dream for blacks and other minorities. Using this data, the HOLC devised a four-tier rating system for classifying a particular neighborhood’s projected economic stability. HOLC “Residential Security Maps” categorized each neighborhood by letter and color—ranging from first-grade neighborhoods, described as new, homogeneous, and “in demand” (A, green), to undesirable areas depicted as having fully declined in property value (D, red). 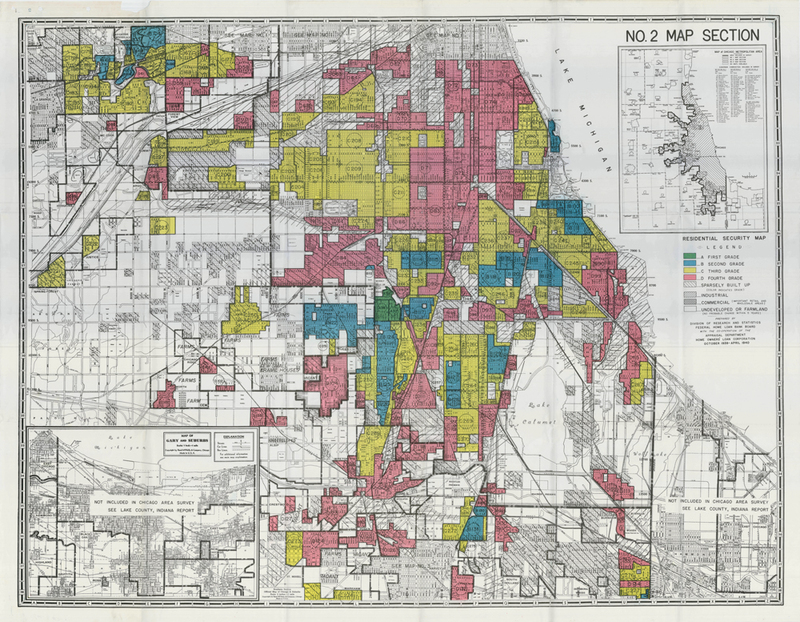 Residential demographics in Indianapolis during this period reveal the extent to which redlining helped preserve the status quo of housing segregation. As historian Richard Pierce observes, in his study on the politics of race in Indianapolis from 1920 to 1970, an overwhelming majority of black families in the city resided in D areas. For example, "[i]n one blighted neighborhood, catalogued as D-25, African-Americans made up 90 percent of the population.” There were no black families that lived in the A areas, and only two resided in one of the city’s seventeen B neighborhoods. Another Indianapolis neighborhood, according to a HOLC appraisal, consisted of a “better class of Negroes, including teachers, doctors, etc., many of whom are home-owners. Local lending institutions are satisfied to make loans to people in this class in this neighborhood.” However, the neighborhood was still classified as D-27, evidence that class distinctions made little difference under the appraisal system. — Richard Pierce, Polite Protest: The Political Economy of Race in Indianapolis, 1920-1970 (2005). Lockefield Gardens was a community rather than simply a collection of residential structures; the plan included an elementary school, a play yard, and ample living space between and behind apartment buildings. Developers believed that children needed space to play and that families needed an area to call their own—a relatively novel idea in the late 1930s. Row houses were placed facing a central mall, or green, which was a large, landscaped area. Designers used only one-fourth of the physical space allocated to the project for the actual buildings, the rest was landscaped. Whatever its merits or drawbacks, the Lockefield Gardens project failed to alleviate the increasingly severe housing shortage. In the years following the Second World War, housing discrimination continued to plague black families living in Indianapolis. When city officials declined federal aid for additional public housing, African-Americans took a novel approach to meet their residential needs. In 1946, the Flanner House, a social service center for the Indianapolis African-American community, petitioned the Indianapolis Redevelopment Commission to purchase land north of Crispus Attucks High School for redevelopment. In exchange for land and building materials, African-American clients were to invest “sweat equity” by providing the labor. As the largest self-help housing program in the U.S. at the time, Flanner House constructed over 330 homes between 1950 and 1964. City leaders and many throughout the African-American community hailed the project as a success. And with good reason. Among those families that participated, only four lost their homes to foreclosure. However, the program was not without its critics, including leadership among the NAACP. Not only did the project help maintain segregated housing patterns by concentrating redevelopment efforts in a predominantly African-American neighborhood, but it displaced existing poor residents to the benefit of a smaller middle-class. the precarious path to progress: HOUSING DESEGREGATION, PARK PRESERVATION & THE CASUALTIES OF "URBAN RENEWAL"
As with Lockefield Gardens, the Flanner project—with an average annual construction of just over 30 homes—did little to relieve the housing shortage in Indianapolis. By the early 1960s, legislative reform seemed to be the only way to ensure fair housing for African-Americans. In 1964, Indianapolis Mayor John Barton, prompted by a growing civil rights movement and the strong urging of Governor Matthew Welsh, commissioned the drafting of open housing legislation. Sponsored by Rev. James L. Cummings and Rufus Kuykendall (the only two African-American members of the city council at the time), General Ordinance 56-1964 prohibited discriminatory practices in the sale, lease, rental, or financing of property “because of race, color, religion, ancestry or national origin.” The ordinance passed, but not before it was amended to omit clauses prohibiting racially restrictive covenants and real estate brokers from influencing prospective homebuyers by referring to a particular neighborhood’s racial composition. In short, the ordinance’s lack of genuine force presented little more than a token effort toward fair housing in Indianapolis. Despite the persistence of segregated housing during the 1950s and 1960s, a few neighborhood associations—including the Highland-Kessler Civic League, the Devington Communities Association, and the Spring Mill Hoover Association for Residential Participation—challenged the status quo, some with greater success than others. 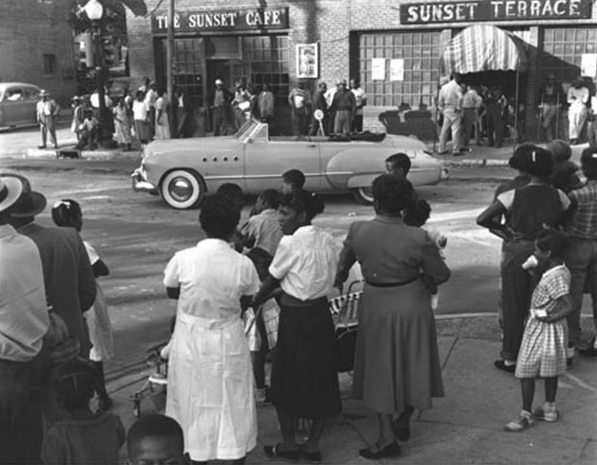 In 1956, a group of black and white families formed the Butler-Tarkington Neighborhood Association, which sought to promote “better communication among the residents” while “preventing inter-group conflicts.” The BTNA’s ultimate goal was to maintain the “quality of the neighborhood” while establishing a strong “sense of community among the residents.” While portions of the neighborhood remained disproportionately white or black, the BTNA demonstrated that, contrary to popular belief, residential integration did not necessarily precede depreciation in property values. The BTNA’s preservation of Tarkington Park illustrates an uncommon form of environmental justice in Indianapolis at the time. By the late 1950s, the park—bounded to the north and south by 40th and 39th Streets and to the east and west by Meridian and Illinois Streets—had fallen into serious disrepair from years of neglect. Local businesses targeted the park for commercial development, seeking to transform the green space into a parking lot. However, the BTNA persuaded the Metropolitan Planning and City Parks Departments to preserve the park through funding and maintenance staff, providing the neighborhood with a safe and sanitary recreational environment. Unfortunately, successful efforts at residential integration and environmental preservation failed to extend much beyond the neighborhood boundaries of Butler-Tarkington. 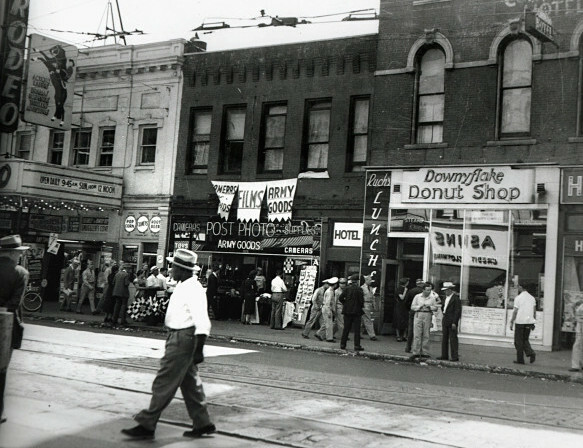 Instead, many of the traditionally African-American neighborhoods of Indy’s urban core succumbed to the “urban renewal” programs of the 1950s and 1960s. City officials sought to clear “blighted” areas rather than revitalize them, transforming the physical environment at great social and cultural expense. As government subsidies shifted away from urban redevelopment, suburban sprawl added to the costly extension of public services to outlying, metropolitan areas. Perhaps the most well-known urban residential casualty was the neighborhood surrounding Indiana Avenue. By the early 1970s, the once-vibrant African-American community had given way to the construction of I-65 and the IUPUI campus. Today, only a few historic buildings—including the Madame Walker Theatre—remain as testaments to the neighborhood’s legacy. Madame Walker Theatre, 1930s. Indiana Historical Society, Digital Images Collection. House located at 725 West Vermont Street, on the IUPUI campus (1975). 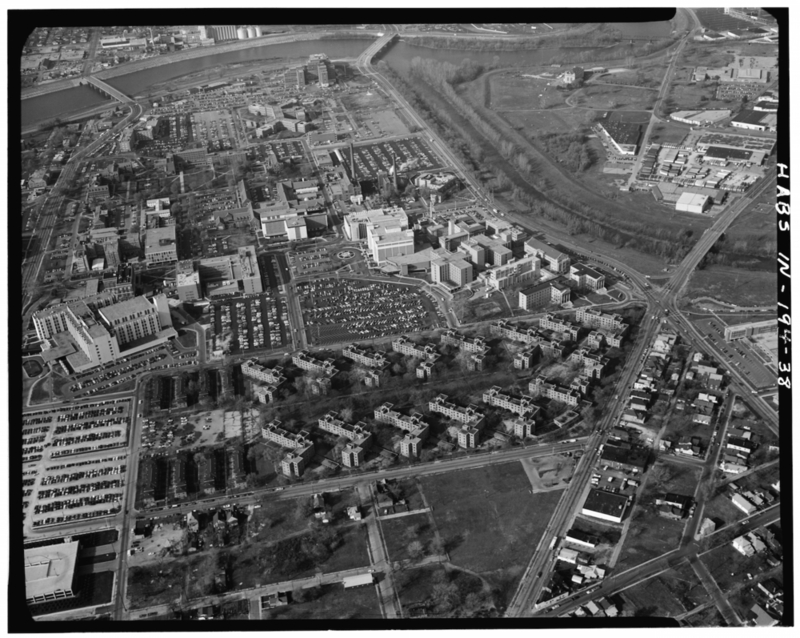 The construction of IUPUI (and nearby I-65) displaced hundreds of urban residents by the late 1960s and early 1970s. The diversion of public funding and private investment in downtown Indianapolis led to further decline in the urban environment. Housing abandonment, demolition by neglect, mortgage foreclosure, and declining property values plagued several neighborhoods during the last decades of the 20th century. To make matter worse, many of the businesses that had served local needs—including supermarkets and small, black-owned establishments—closed their doors, leaving residents with limited access to healthy food or basic goods and services at affordable prices. The Fall Creek neighborhood—bounded by Meridian Street to the west, Fall Creek Parkway to the north, College Avenue to the east, and 22nd Street to the south—illustrates the rapid decline of the physical environment during these years. By the early 1980s, following years of disinvestment, the neighborhood—formerly referred to as “Dodge City” because of its high crime rate—consisted largely of vacant lots and abandoned homes. Although many low-income, minority families continued to reside there, the city directed few resources to help repair the area’s increasing blight. The disinvestment of Indy's downtown neighborhoods following the “urban renewal” programs of the 1950s and 1960s not only created a landscape of blight and disrepair, but also left an aging, broken, and unsanitary infrastructure. Perhaps most representative of this environmental injustice was the city's outdated combined sewer system, which was literally flooding (in fact, continues to flood) many urban residential areas with raw sewage. 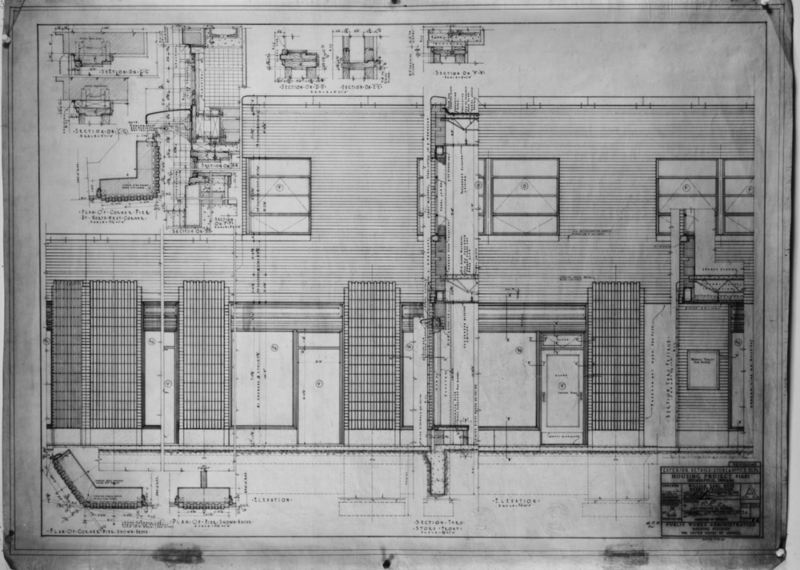 A relic of early-20th century urban development, combined sewer systems were designed to collect rainwater runoff, domestic sewage, and industrial wastewater in the same pipe for conveyance to a sewage treatment plant. However, during periods of heavy rainfall or excess snowmelt, these systems were specifically engineered to overflow and discharge excess wastewater directly into nearby streams, rivers, or other bodies of water. These “combined sewer overflows” (CSOs) contain untreated human and industrial waste, toxic materials, and other hazardous pollutants. Although federal law prohibited construction of combined sewer systems after July 1, 1977, the EPA and most state environmental programs failed to address the CSO problem until the late 1990s. In 1987, the EPA delegated responsibility for CSO permitting to the Indiana Department of Environmental Management. However, absent strict federal regulations, there was little incentive to comply with water quality standards under the Clean Water Act. And because most urban communities in Indianapolis (as with many others across the U.S.) lacked the resources or political strength to enforce these standards, they were left to suffer from the environmentally hazardous legacy of these outdated sewer systems. In adding insult to injury, the growth in suburban residential developments led to even heavier sewage overflow in Indy's downstream urban neighborhoods. In 1999, two environmental justice organizations—Improving Kids’ Environment and the Hoosier Environmental Council—filed an administrative complaint with the EPA’s Office of Civil Rights on behalf of minority residents of the Fall Creek and White River neighborhoods (the population of which, at the time, was more than 85% black). The complaint alleged, among other things, that the city—while investing limited resources in new suburban residential developments—had failed to remedy CSOs in the urban neighborhoods, resulting in a disproportionate environmental impact in violation of EPA’s Title VI regulations. In 2001, the EPA accepted the complaint for investigation, ultimately leading to a settlement in which Indianapolis agreed to a long-term CSO control plan aimed at eliminating the discriminatory effects of the city's obsolete sanitation services. The consent decree into which the parties entered in 2006 requires the capture and treatment of 95% and 97% of the sewage overflows in the White River and Fall Creek watersheds respectively. Contemporary developments in the Fall Creek neighborhood yielded further gains for environmental justice advocates. In 2001, the City of Indianapolis partnered with several private investors to revitalize the neighborhood. The King Park Development Corporation (KPDC)—a “non-profit community development corporation committed to improving housing, economic development, and quality of life”—managed the project, with assistance from the Historic Landmarks Foundation of Indiana. Project planning involved a steering committee of city leaders, local residents and business owners, and other stakeholders to ensure meaningful community involvement in the revitalization process and sustained or improved property ownership stability and affordability. Today, according to the KPDC, there are over 400 homes in Fall Creek Place, and “the neighborhood is much ‘greener’ than before, with one new city park, three new neighborhood parks and a new linear greenway along Fall Creek." Urban Revitalization: Community Empowerment or Adverse Impact? Revitalization projects such as the development of Fall Creek Place have great potential for boosting the local economy and stimulating environmental recovery, leading to increased public health and enhanced quality of life for many urban residents. The costs and benefits of this process, however, are not always proportional to the stakeholders involved. Adverse impacts, while often unintended, may result from a lack of community involvement or input from existing residents. “Gentrification”— the displacement of existing, typically lower-income residents as a result of increased property values and taxes—represents a particularly harmful impact. The socio-economics of urban revitalization are complex and present unique challenges to each community. However, adverse impacts can often be mitigated through careful planning and effective communication. While it is important to identify the interests of public and private investors, it is equally important to include members of the community as key decision makers in the process. The goal is to identify a variety of creative solutions to accommodate the mix of community needs and interests. Indianapolis has come a long way since the housing segregation policies and “urban renewal” programs of the early to mid-20th century. In recent years, the Indiana Department of Environmental Management has shown a promising commitment to furthering the goals of the environmental justice movement. Moreover, the city’s long-term CSO control plan promises to improve the quality of life for many urban residents through environmental restoration and, consequently, economic revitalization. These small, albeit important, indicators of progress should not, however, distract from other areas in need of change. Today, for example, Tarkington Park seldom receives visitors, having once again fallen into disrepair from neglect and rising crime in the area. In 2012, a collective of neighborhood residents, local businesses, city officials, and other key stakeholders proposed a $5 million redevelopment plan for the park, aiming to stimulate investment in the surrounding retail and residential areas. The revitalized park would also provide a healthy recreational environment for local residents. However, financial commitment to these plans has yet to be fully realized. The story of environmental justice contains multiple narratives. Community leaders, public officers, local residents, lawyers, politicians, waste facility operators, environmental officials, and others possess a variety of unique interests—some competing, some shared. As the environmental justice movement expands and draws greater public involvement, its success depends in large part upon building bridges and forging a stronger community ties. Sometimes, shared interests result from a process of deliberative negotiation. Opportunities for public participation in the environmental decision-making process have become more democratic and consensus-driven in recent years. In several states, for example, local advisory committees are appointed to assess and report on the social, economic, and environmental impact of proposed waste facility sitings. Other times, external forces provide the necessary catalyst for collaboration and change. The CSO litigation, for example, brought together a range of organizations in support of environmental justice, including Concerned Clergy, the Sierra Club (one of the traditional “Big Green” organizations) and local neighborhood associations. Other strategies in achieving environmental justice include legislative and political advocacy, media campaigns, community outreach and public education, translation services for non-English speaking communities, and other creative approaches. The ultimate goal, of course, is not simply to reallocate environmental burdens so that all communities suffer equally. To the contrary, environmental justice seeks pollution protection for all persons, regardless of income, race, or ethnicity. However, until that goal is realized, those without the technical know-how, resources, or political clout to protect their own interests deserve greater advocacy from the community at large. Bullard, Robert D., ed., The Quest for Environmental Justice: Human Rights and the Politics of Pollution (2005). Cole, Luke W., and Sheila R. Foster, From the Ground Up: Environmental Racism and the Rise of the Environmental Justice Movement (2000). Hurley, Andrew, Class, Race, and Industrial Pollution in Gary, Indiana, 1945-1980 (1995). Jackson, Kenneth T., Crabgrass Frontier: The Suburbanization of the United States (1985). Pierce, Richard B., Polite Protest: The Political Economy of Race in Indianapolis, 1920-1970 (2005). Rector, Josiah, Environmental Justice at Work: The UAW, the War on Cancer, and the Right to Equal Protection from Toxic Hazards in Postwar America, 101 J. Am. Hist. 480 (2014). Roisman, Florence Wagman, Property and Human Rights (2012). Silver, Christopher, The Racial Origins of Zoning in American Cities, in Urban Planning and the African American Community: In the Shadows (June Manning Thomas & Marsha Ritzdorf, eds. 1997). Thornbrough, Emma Lou, African-Americans, in Encyclopedia of Indianapolis (David J. Bodenhamer & Robert G. Barrows, eds. 1994). Thornbrough, Emma Lou, Segregation in Indiana During the Klan Era of the 1920’s, 47 Miss. Valley Hist. Rev. 594 (1961). Waterhouse, Carlton, Abandon All Hope Ye That Enter? Equal Protection, Title VI, and the Divine Comedy of Environmental Justice, 20 Fordham Envtl. L. Rev. 51 (2009). The Geography of Pollution: Mapping Environmental Justice in Indiana ("GOP Project") is a collaborative project created by Ryan Schwier and Peter Elliott, students at the Indiana University Robert H. McKinney School of Law, for a semester-long course taught by Prof. Carlton Waterhouse during the fall of 2014. The project is geared toward a general audience as well as scholars and practitioners (legal, environmental, or otherwise). For those with a casual interest in learning about environmental justice, the project provides an introductory overview through historical narrative and engaging interactive media. For those interested in researching the topic further, the site provides links to a variety of primary sources, including legal and administrative materials (court documents, EPA decisions, etc. ), historical maps, and community action plans. Structurally, the project entails three components: (1) an introductory historical narrative with interactive media, (2) an ongoing investigation of lead-contaminated sites throughout the state, and (3) a resource toolkit. The first component of this project provides a historical overview of the environmental justice movement. Through narrative text and interactive media, this portion of the project includes (1) a broad introduction to the EJ movement in the United States, discussing significant events and persons that have defined the movement at the national stage; and (2) contemporary developments in Indiana, examined in close historical context with an emphasis on the state’s two largest urban centers—Indianapolis and Lake County. By drawing on a range of primary and secondary sources, the purpose of this section is to illustrate patterns of environmental inequities over time and to provide a basis or starting point for addressing lingering issues of injustice today. In 1980, Congress enacted the Comprehensive Environmental Response, Compensation, and Liability Act (CERCLA), 42 U.S.C. § 1906 et seq., commonly known as “Superfund.” The law established a tax on the chemical and petroleum industries, which went into a trust fund (the “Superfund”) for cleaning up abandoned or uncontrolled hazardous waste sites. In addition to creating property owner liability for site contamination (both past and present), CERCLA authorizes two types of response actions: (1) short-term removals to address hazardous substance releases or threatened releases requiring prompt response; and (2) long-term remediation to permanently and significantly reduce the dangers associated with releases or threatened releases of serious (albeit not immediately life threatening) hazardous substances. The latter of these actions are conducted only at sites listed on EPA’s National Priorities List (NPL). Lead is one of the most frequently occurring contaminants at Superfund sites. Over 300 sites on the Superfund National Priorities List (NPL) have lead as a contaminant of concern. Over 70 are contaminated with lead from smelting and mineral processing operations. The presence of lead at these sites poses a potential threat to human health, especially to children, when ingested or inhaled. In 2012, USA Today published “Ghost Factories,” an online interactive report detailing the results of a 14-month investigation on neglected lead factory sites, which state and federal regulators had either overlooked or failed to examine closely for potential health hazards to surrounding communities. Through research of historical maps and industry directories, investigative journalists discovered evidence of former smelting, foundry work, or lead manufacturing activity at more than 230 sites. With the assistance of environmental specialists, the USA Today conducted soil tests in 21 smelter neighborhoods across 13 states (including Indiana) to determine the level of lead at a particular site. The investigation, which was based on an article published in 2001 by William Eckel in the American Journal of Public Health, has resulted in the EPA and several states conducting investigations and examining health risks at hundreds of sites nationwide. The Geography of Pollution project seeks, in part, to build upon the USA Today report by identifying other potentially contaminated sites in Indiana. However, The Geography of Pollution project is limited to researching historical evidence of potential lead contamination; it has not conducted soil tests at any of the sites listed here. In addition, many of these sites here include those those previously identified by either the U.S. Environmental Protection Agency (EPA) or Indiana Department of Environmental Management (IDEM). These sites are featured here to bring attention to the (often-protracted) efforts of state and federal agencies in responding to environmental cleanups in certain urban areas of the state. Research for this project consisted on two phases: (1) identifying sites with historical evidence of lead contamination, and (2) cross-checking those sites with EPA and IDEM databases to determine past or current remediation (or cleanup) efforts by either agency. The first phase involved researching several historical sources; these included industry and manufacturing directories, city directories, newspaper articles, Sanborn Fire Insurance maps, and other materials. A majority of this research was conducted at the Indiana State Library and the Indiana University-Purdue University Indianapolis (IUPUI) Library (including digital collections). The focus on lead is particularly significant to the environmental justice movement. Minorities, especially African-Americans, suffer from much higher levels of lead poisoning than the U.S. population as a whole. This is largely the result of living conditions; because of the high concentration of minorities in urban areas, African-Americans are frequently exposed to lead-based paint in older homes and from decades of accumulated industrial pollution found in the surrounding air, soil, and water. The effects of lead on minority children, who are much more likely to be exposed to the toxic substance from play (both indoors or outdoors), have particularly devastating consequences on mental and physical development. Historical documents, including maps, zoning ordinances, institutional studies, newspaper articles, and more.